ILRI veterinary epidemiologist Delia Grace presenting at the United Nations Environment Programme (UNEP) Science-Policy Forum that preceded the second session of the United Nations Environment Assembly (UNEA-2), on 20 May 2016 (photo credit: ILRI). 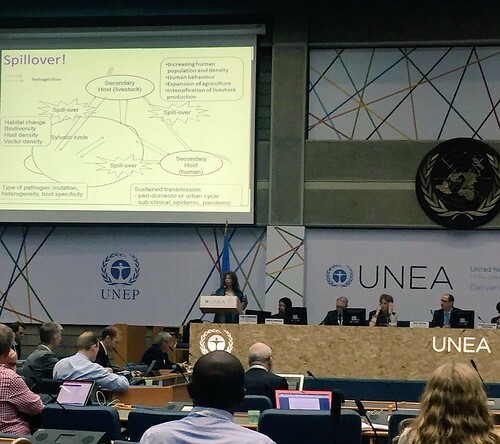 The United Nations Environment Programme (UNEP) held its first global Science-Policy Forum in Nairobi, Kenya on 19-20 May 2016 as part of the overall programme of the second session of the United Nations Environment Assembly (UNEA-2) held on 23-27 May 2016. The forum offered a platform to the science community to engage with policymakers and civil society stakeholders on the science and knowledge needed to support informed decision-making to deliver on the environmental dimension of the 2030 Agenda for Sustainable Development.